When people say they want to lose weight, they usually mean they want to lose fat. Despite knowing that the scale is not the most reliable indicator of fat loss, many women still consider it the end-all-be-all of their success. 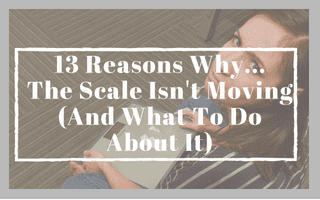 This post reveals 13 factors that can impact your weight on the scale, why you shouldn’t freak out about fluctuations, and what to focus on, instead. You’ve probably noticed that you don’t experience consistent drops week after week. Some weeks you see a big drop, other weeks, you do the exact same things and nothing seems to change. While frustrating, this is totally normal. Most people – but especially women – experience discontinuous fat loss, meaning that it happens in starts and stops. This can result in you feeling like you’ve been doing everything right and have nothing to show for it. Glycogen is the stored form of carbohydrates. For each gram of carb that your body holds on to, it also retains 3g of water. The fewer carbs you have stored, the lower glycogen’s contribution to your weight variance. If you go on a low-carb or ketogenic diet, or even just try to match your carb intake to your activity level, you’re taking in way fewer carbs than your body is accustomed to. As you deplete your body’s stores, away goes that water retention, as well. Rapid, initial weight loss on a lower-carb diet is likely due to this, not actual fat loss. On the other hand, if the scale is up after a day or two of more carbs than your body is used to, the increase is likely due to the water retention that accompanies the excess glycogen. If you are consistent in your carb intake, this should regulate itself. This is NOT to say that carbs are bad/to be avoided anything to be wary of. A certain amount of carbs are necessary to help your body fuel for, and recover from, your workouts and busy lifestyle but that amount can vary greatly so consider experimenting with how many carbs make you feel best. These are all related so I’m grouping them together to avoid repetition. Much like glycogen, sodium pulls water into your cells that they temporarily retain until balance can be restored. If you’re feeling swollen, bloated, or heavier after a meal or day of more salt than you’re used to, it’s likely due to water retention. Keep this in mind if you eat at restaurants of have more processed foods than normal, as they’re likely to be higher in sodium than from-scratch-home-cooked meals. When you deplete sodium, water retention decreases, which is the essence of weight manipulation that many weight class athletes use to make weight. Sweat – another way your body loses water – can impact the scale, as well. Weighing yourself immediately post-workout when you’ve just sweated out a good amount of water can show a drop in weight that will be short-lived as soon as you rehydrate. Conversely, chronic dehydration can slow or stall weight loss by slowing down digestion and various metabolic processes. Like your individual level of carbohydrate intake, hydration needs may vary, as well, depending on how hot or cold it is where you live and how much time you spend outside, how active you are, what your diet is like, and more. A good starting point is about 8 cups per day. Body recomposition is when you lose fat but gain muscle at a similar rate, which results in a leaner physique but minimal change on the scale. Two groups of people who are likely to experience this initial phenomenon are beginners who have a lot of body fat to lose and formerly lean or muscular people who are returning from a hiatus. The end result is that you may look and feel leaner, be losing inches, and fitting into smaller clothes, but not see many changes on the scale right off the bat. Eventually it becomes very difficult for your body to maintain this swap so typically after the initial recomposition, fat loss becomes more dominant and you begin to see this reflected on the scale. You’ve probably experienced the bloat and discomfort that can accompany your monthly cycle. The changes in your hormones during that time of the month can cause water retention and an alarming jump in the scale that can mask any fat loss that is actually occurring. As you move through your cycle, things will return to normal. It’s helpful to track your cycles using a calendar or app so that you aren’t caught off guard when you see that totally-normal jump. In the long-run, you may find it helpful to compare your weight to the same week in your previous cycle. So compare cycle week 1 of May to cycle week 1 of June, that way you’re comparing apples to apples. Cortisol is a hormone released when your body perceives a threat (stress) that acts similar adrenaline. Ancestrally, it was to help you survive an acute situation like being chased by something that wanted to eat you. Once the coast was clear, things went back to normal. In present day, our stressors are almost constant, which means that cortisol is chronically released. -Makes your cells less responsive to the signals of other hormones like insulin and leptin. The end result is fat essentially being trapped in your cells, and feeling hungry all the time. -Increases inflammation which makes your body more likely to store visceral fat (fat around your organs which can increase your odds of organ damage), which, in turn, releases its own inflammatory signals. -Dysregulates hunger hormones by increasing the ones that make you hungry. In short, stress makes it harder to lose weight. So if your stress levels are drastically different from one week to the next, that could be playing a role in how you’re feeling and what the scale has to say. Your body also releases cortisol in response to being over-tired so lack of sleep could be contributing, as well. The remaining factors are less scientific and potentially more obvious but they bear mentioning as a reminder, nonetheless. Having a full bladder and/or bowels is adding mass to your frame, even though it’s temporary. If you’re really curious about this, you can try weighing yourself pre- and post-BM and seeing the difference. Much like your bathroom status, having undigested food in your stomach can contribute to your scale weight, even though it’s not really a part of you. Once that food is digested and the waste excreted, your scale weight will reflect that change. Compare your scale weight on an empty stomach and then again after eating if you’re curious about the effect. Maybe the most obvious but weighing yourself in a sweater, jeans, and boots, is going to show a higher output than weighing yourself nekkid. Put on your heaviest outfit and compare the two if you want. Hopefully this info is a little bit enlightening and helps you feel less frustrated with the absolutely normal scale fluctuations you will likely experience during your journey. The important thing is that you are trending the right direction. One single data point isn’t particularly useful without context so make sure to keep the big picture in mind. What the scale says is not directly in your control. All you can do is engage in the behaviors that will make you more likely to reach your goals. You cannot control how quickly that happens or if you have a week of staying steady before experiencing a big drop. Remember that the scale is not the end-all-be-all. There are dozens of other factors that maybe be as – if not more – important as your scale weight. In fact, you are not required to use the scale at all. If it does more harm than good, you may just be better off taking a hiatus and focusing on other progress indicators. This Progress Indicator Cheat Sheet bundle will give you tons of ideas of other things to track in addition to what you weigh on the scale. Food – Stick to whole nutrient-dense foods that you know are supporting your goals. Workouts – How often you exercise, what you do, and how intensely you work. Commit to coming to at least 3 workouts per week and giving it your all when you’re at it. Not sure what to eat or do for workouts? Download your free copy of the Body Transformation Guide for all you need to know. Rest/Recovery – Take the rest that your body demands and spend some time on restorative practices like yoga, stretching, and foam rolling – you’ll actually get better results than if you spent all your time pushing yourself to the max. Stress Relief – Unaddressed and excessive stress can slow or stall weight loss. While you might not be able to eliminate stressors altogether, you can regularly engage in stress relieving activities like yoga, meditation, walks, quiet time, etc. Sleep – Regardless of what you have going on, you can still make an effort to create and stick to as much of a sleep ritual as you are able. Try to minimize eliminate use of electronics an hour before bed, give yourself plenty of time to wind down before bed, and sleep in a cool, dark room. Attitude – Adjust your expectations away from overnight results and toward making this a lifestyle change that will serve you for the rest of your life. Speak to yourself with the same kindness and positivity that you would a friend or family member. Hopefully this info helps you feel a little more in control when you step on the scale. Just don’t give up. Keep showing up, keep putting in the work, commit to this journey, and the results WILL come.